Modern aircraft design is both an art and a science. Aircraft design and manufacturing was once the almost exclusive domain of vertically-integrated companies that assembled parts made by hundreds, if not thousands, of subcontractors and suppliers. Bombardier Aerospace broke with tradition in the mid-1990s, when it launched the Global Express by splitting the $1 billion development cost with risk-sharing Tier 1 partners, led by Mitsubishi Heavy Industries (MHI) of Japan. MHI learned a lot while designing, building and integrating the Global’s complex supercritical wing and centre fuselage. A little over a decade later, MHI was designing and assembling the outer wing box of the 787 Dreamliner, the most advanced airliner in the world. MHI’s partnership with the Canadian aerospace industry was mutually beneficial–so much so that in April 2006, MHI decided to join the Canadian aerospace industry when it opened an aerostructures facility in Mississauga, Ont., to support its work with Bombardier. 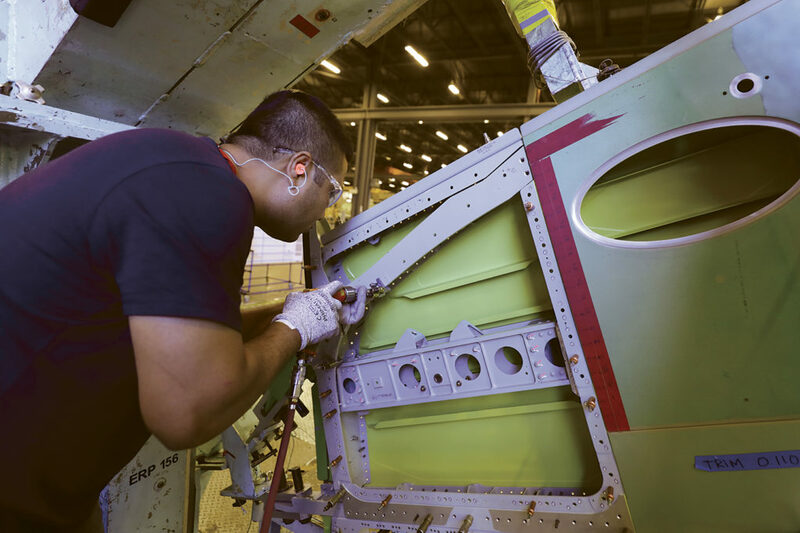 The trend in recent years has been for major OEMs to shift aerostructures work to regions with lower labour costs, but this can impact schedule and quality. As demonstrated by MHI and MHI Canada, a better solution is a combination of highly skilled workers and greater automation. McCarthy sees plenty of opportunities for growth, and looks to both the future and the past for his inspiration. “I want to revitalize aerospace manufacturing in Malton, once home to industry giants like Victory Aircraft, A.V. 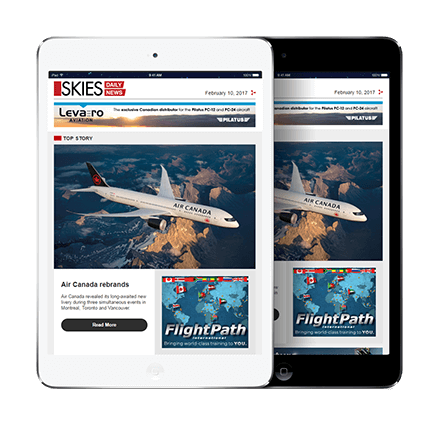 Roe Canada, McDonnell Douglas Canada and Boeing Toronto,” said McCarthy on the occasion of MHI Canada’s 10th anniversary in 2016. A total of 2,091 aircraft were built at Malton [now Mississauga] between 1938–when National Steel Car’s Aircraft Division opened a factory at the new airport–and Ottawa’s cancellation of the Avro Arrow on Feb. 20, 1959. Not many people know that Malton’s greatest contribution to commercial aviation occurred between 1964 and 2006, when up to 7,000 people built wings for every McDonnell Douglas passenger jet (except the DC-8) and the Boeing 717. Now, MHI Canada is looking to write a new chapter by almost doubling the size of its manufacturing facility in Mississauga, to capture new wing and fuselage production work from the leading aircraft manufacturers. MHI is a US$40 billion a year Fortune 500 company that employs 84,000 people at 300 domestic and international subsidiaries. The company is active in nine core industrial sectors: aircraft, space, energy, ship and ocean, transportation, material handling, environment, automotive and industrial machinery. Mitsubishi started building Renault aircraft engines under licence in 1916 and flew its first aircraft in Nagoya in the early 1920s. The company was the largest producer of aero engines and a major producer of military aircraft during the Second World War, and in the postwar years rebuilt its capability by building American-designed aircraft under licence for the Japanese military. This included the F-86F Sabre fighter jet in the 1950s, followed by the F-4 Phantom, F-15J Eagle and Sikorsky SH-60J Sea Hawk helicopter. Home-grown MHI designs included the MH2000 helicopter, F-2 (based on the General Dynamics F-16), and the MHI X-2 advanced technology demonstrator jet. In the 1960s, the Japanese government also jump-started the civil aircraft manufacturing industry by funding a consortium (that included MHI) to develop the 60-seat NAMC YS-11 twin turboprop airliner, which was exported to customers in 15 countries, including Transair in Canada. The Mitsubishi MU-2 turboprop (700 built) has been flown in Canada for almost 50 years, and the MU-300 Diamond business jet first appeared in the early 1980s before Beechcraft purchased the design and rebranded it the Beechjet 400/400A, T-1 Jayhawk and Hawker 400/400XP. When Bombardier embarked on advance studies for an ultra-long-range business jet that would leapfrog the competition, company engineers told Bombardier chairman Laurent Beaudoin in 1991 that the aircraft would cost $1 billion to develop. The cost was too much for Bombardier to carry on its own, so it partnered with leading Tier 1 aerospace suppliers–MHI, Rolls-Royce BMW, and Safran (Messier-Bugatti-Dowty) — to share the development cost in exchange for a share of future profits. Tier 1 systems integrators by definition take full responsibility for equipment and systems provided to an original equipment manufacturer (OEM), including design, assembly and services, with the expectation of technical and financial risk. Bombardier pioneered the Tier 1 risk-sharing model, but it was later adopted by Embraer, Boeing and Airbus. Mitsubishi Heavy Industries signed on as a risk-sharing partner in September 1993 to build the Global Express’ 28.7-metre (94-foot) wings, featuring an advanced supercritical airfoil with a 35-degree sweep and winglets. The work package included the design and fabrication of the wing and centre fuselage, structural assembly, wing/centre fuselage joint (pre-fit), flight control installation and riggings, and systems installation and functional test. MHI began machining the lower wing skins for the prototype at its Oye plant in Nagoya in February 1995. In October 1995, Bombardier and MHI partnered on the Q400 airliner, with MHI designing and building the forward-, mid-, and aft-fuselage, vertical fin, horizontal stabilizer, elevator, rudder and door. And, in 1999, MHI became a risk-sharing partner on the Bombardier Challenger 300 (first known as the Continental), responsible for designing and building the 21-metre (69-foot) span wing with a 27-degree sweep, plus structural assembly, systems installation and functional test. There was a lot of pride at MHI in Japan when the first Bombardier Global Express flew in October 1996, the first Q400 in January 1998, and the first Challenger 300 in August 2001. Japan has always been a large market for Boeing wide-body jets, which fly numerous short-haul, high-traffic domestic routes and long-haul services. In the 1980s, Boeing enlisted the largest Japanese aerospace companies–MHI, Subaru (formerly Fuji Heavy Industries), Kawasaki Heavy Industries and ShinMaywa Industries–as major parts suppliers on each new jet. Today, MHI produces the inboard flaps for the Boeing 737, the centre wing box and inboard flaps for the 747, aft fuselage panels and cargo doors for the 767, and the aft fuselage panels, tail fuselage section and passenger entry doors for the 777 and new 777X. When Boeing launched development of the 787 Dreamliner, it aggressively outsourced major assemblies of the advanced technology aircraft to Tier 1 partners. “Team Japan” secured 35 per cent of the work on the 787 program, with MHI responsible for the structural design, manufacturing and assembly of the 787’s outer wing box (including composite spars, skins and stringers), which has a high aspect ratio combined with efficiency-enhancing raked wingtips. MHI and Bombardier agreed to transfer Q400 fuselage and parts manufacturing from Nagoya to Shenyang Aircraft Co. in China and the CRJ700/900 aft fuselage production to Shorts in Northern Ireland. In 2008, the Japanese government announced the development of Japan’s first commercial aircraft since the YS-11. This became the Mitsubishi Aircraft Corp. (MAC) MRJ70 and MRJ90, powered by the Pratt & Whitney PW1200G geared turbo fan (GTF) engine. The MRJ90 is expected to enter service in 2020 and the MRJ70 in 2021. In April 2006, MHI decided to open a 90,000-square-foot facility in Mississauga to take over work previously done in Japan and at the Bombardier factory. Global wings and centre fuselages were shipped from Japan to a factory on Meadowvale Drive, where MHI Canada employees used lasers to precisely set the dihedral, sweep and incidence of the wing-fuselage splice and hard drill the slightly undersized holes (using contoured drill plates) that would be used to permanently fasten the parts together on Bombardier’s final assembly line. After a centre fuselage was shipped to Bombardier, MHI Canada completed all the downstream work on the wings (including installation of flight controls, fuel, electric, hydraulic systems and functional test). Then, MHI established a low-rate second source assembly line for the Challenger 300 at its Canadian division, utilizing tooling assembly jigs and parts made in Japan. This started out as a low-rate/low-risk experiment; but as results improved, the Canadian plant became the high-rate source for Challenger 300 wings, backed up by low-rate production in Japan. That’s when Ontario drivers began to see Quebec-bound trucks hauling Challenger 300 wings wrapped in blue plastic down Highway 401. MHI Canada outgrew its Meadowvale facility after six years. 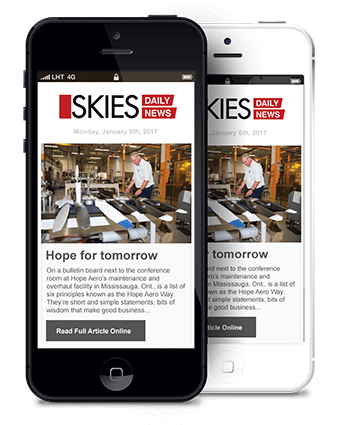 In 2012, a new 250,000-square-foot factory with 20,000 square feet of office space opened on Northwest Drive in Mississauga, at a location directly under the glide path to Runway 23 at Toronto Pearson International Airport. From the beginning, the new MHI Canada factory was designed to incorporate innovation, automation (robotics), lean manufacturing, and flexible work cells, but the transformation was gradual since it involved many technology demonstration projects, according to Tsoulis. Two different approaches were taken to upgrade the tools and methods used to build the Challenger 300/350 and Global 5000/6000 wings, which is evident during a factory tour. One production bay is dedicated to the Challenger 350 and three to the Global 5000/7000 wing and centre fuselage. For the Challenger 300, the company gradually modified the twin assembly lines built in Japan so they could accommodate automated drill (auto-drill) equipment designed to safely work alongside staff. Experimental development of the auto-drill was performed on the Challenger 300 assembly line prior to its gradual phase-in. Bombardier launched the Challenger 350 in May 2013, incorporating a new winglet and changes to the wing skins, spars and ribs. 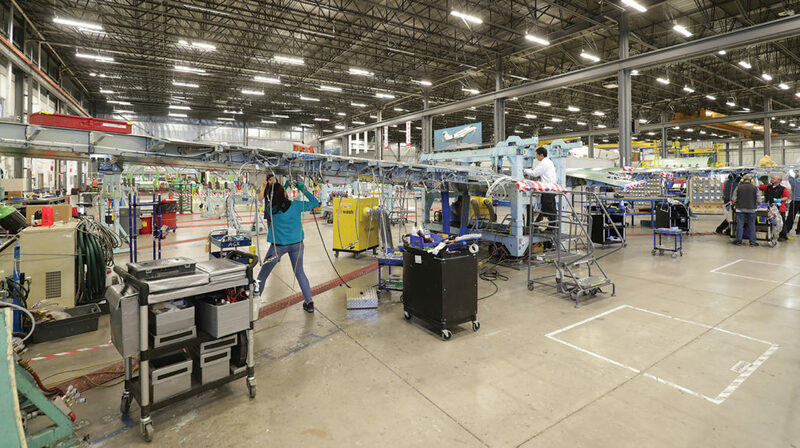 A dedicated Challenger 350 wing assembly line was created without auto-drill capability. MHI Canada built wings for the Challenger 300 and 350 in parallel until the “market voted” and production of the 300 was phased out. At that point, the twin Challenger 300 wing assembly lines with auto-drill were converted to Challenger 350 build capability, and the dedicated 350 line without auto-drill was decommissioned and stored. 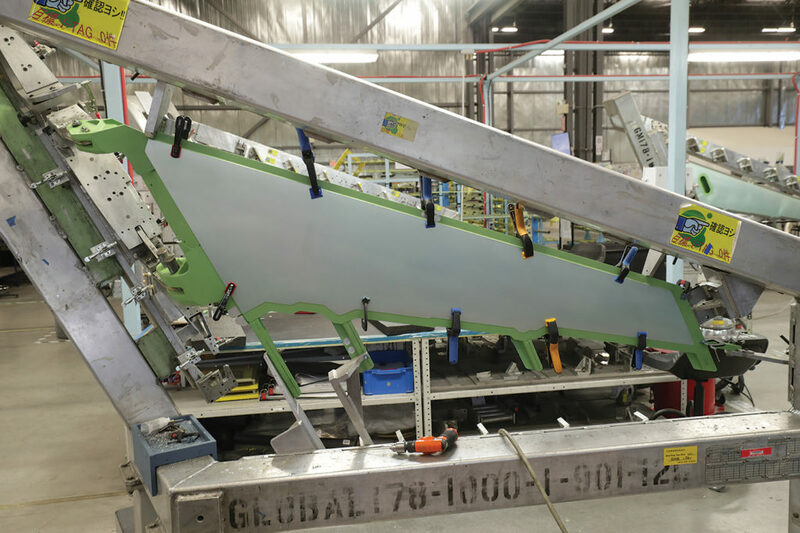 For the Global 5000/6000, MHI developed a completely new manufacturing process for the wing. The foundation was the development of a new flexible work cell that uses a ‘superframe’ to assemble the Global wings. 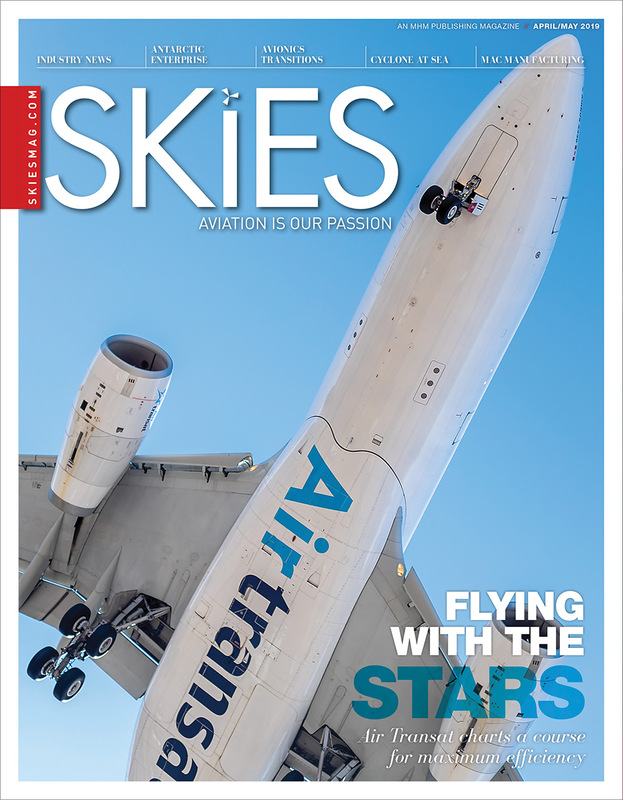 “The Global wing and fuselage are actually more complex than the wings of a narrow body jetliner (like a 737 or A320) because of the Global’s higher speed, ceiling and longer range,” explained Tsoulis. The superframe is mounted on an automated guided vehicle and can be modified to handle wings up to approximately 1,400 square feet or 180,000 pounds maximum take-off gross weight, which pretty well covers all contemporary business jets and single-aisle airliners. This gives MHI the ability to quickly adapt to market needs and conditions. Last year, the company made 72 per cent of the wings on business aircraft delivered by Bombardier. The company will alo produce the new Global 5500 and 6500 wings, each with about 7,000 parts. The amount of fabrication work required to build a wing is roughly proportional to the area of the wing. For example, the Challenger 300 has a wing area of 48.5 square metres (522 square feet) and the Global 5000/6000 a wing area of 94.9 square metres (1,021 square feet). MHI Canada worked with Brown Aerospace, a leader in automated drilling technology, to develop a custom five-axis drilling system that can be used side-by-side on a production line with workers, rather than in an isolated cell. The auto-drill creates a full-sized hole, counter-sinks it, and leaves no coolant residue or metal chips on the metal surface. It’s designed to drill wing skins, ribs, spars and stringers mounted on both horizontal and vertical jigs. When MHI’s Mississauga factory opened, all the parts for the Challenger 300 and Global 5000/6000 were sourced in Japan. In the 2012 aerospace industry review titled Beyond the Horizon: Canada’s Interests and Future in Aerospace (the so-called Emerson Report), the authors place a major emphasis on the development of Canadian Tier 1 systems integrators, as major OEMs strategically reduce their number of approved suppliers. 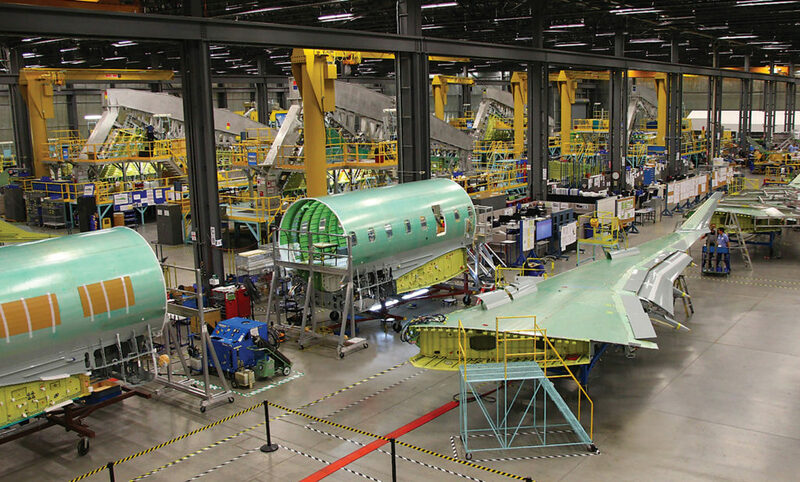 Canada lost a major Tier 1 aerostructures capability when Boeing closed the former McDonnell Douglas wing factory at Pearson Airport in July 2005. “The Tier 1s have to get close to the Tier 2 and Tier 3 companies to collaborate, stimulate innovation, and jointly lower costs,” said Tsoulis. MHI Canada has been actively growing its Tier 2 and Tier 3 supply chain as part of its “Team Canada” strategy to stimulate innovation and lower costs. It is now developing major supply chain partners in Canada, the U.S., Mexico, and the U.K. to support its growth– in addition to MHI’s highly capable and competitive supply chain in Japan, Vietnam and Asia. To support and grow innovation, MHI Canada has developed close working relationships with academic and R&D organizations and works closely with municipal, provincial and federal agencies. The market for aircraft wings is directly related to global demand for business and commercial aircraft. Boeing has forecasted a need for 41,030 new commercial aircraft valued at $6.1 trillion by the year 2036. This includes a requirement for about 2,400 regional, 29,500 single-aisle jets, and 9,100 wide-body aircraft. In addition, Bombardier Business Aircraft forecasted 8,300 deliveries in that segment between 2016 and 2025. The growing demand for single-aisle commercial aircraft has already pushed production for the Boeing 737 and Airbus A320 (and their wings) to record levels, putting a serious strain on the supply chains. 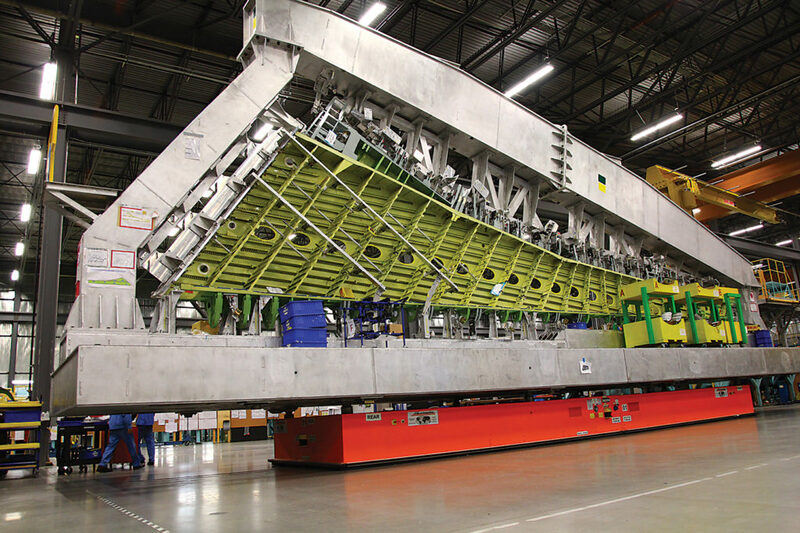 Leading Tier 1 aerostructures companies grow by becoming a supplier on a brand new aircraft platform, a second source for an existing aircraft program, a partner in a government procurement or offset contract, or they step in to replacing a supplier that is exiting the business or can’t meet OEM targets (e.g. cost, schedule or quality). Tsoulis sees many opportunities for growth since MHI Canada is one of the only aerostructures companies in the world that builds large, fully functional wing and fuselage assemblies, and performs the complex wing-to-fuselage join operation. Boeing is actively studying the business case for a New Mid-market Aircraft (NMA) that will fill the payload/range gap between the Boeing 737 MAX 9 and the 787-8. Tier 1 suppliers want to play a major industrial role on the so-called 797, but Boeing might bring a lot of the production in-house after the painful development phase of the 787. However, since then the 787 has become a long-term success and has changed the face of aviation. Boeing and Airbus are applying upward pressure on production rates of the most popular single-aisle jets to clear backlog and stimulate new sales. Boeing is increasing production of its best-selling 737 MAX aircraft to 52 per month in 2018, and is aiming for 57 in 2019. Airbus told Reuters in April 2018 that it is planning to increase production of its A320 family to 63 per month in 2019. Both aircraft programs, plus perhaps the newly-christened Airbus A220 (formerly C Series), could benefit from a second source for wings. Airbus has already indicated that it would like to grow a low-cost North American supply chain for its A321 final assembly line in Mobile, Ala., and has voiced its concern regarding the impact of Brexit–the U.K. leaving the European Union in 2019–since all Airbus wings are made in the U.K. In Canada, Bombardier Commercial Aircraft has stated it would like to reduce the cost of building a Q400 wing, and there has been turmoil in business aviation related to wing contracts. 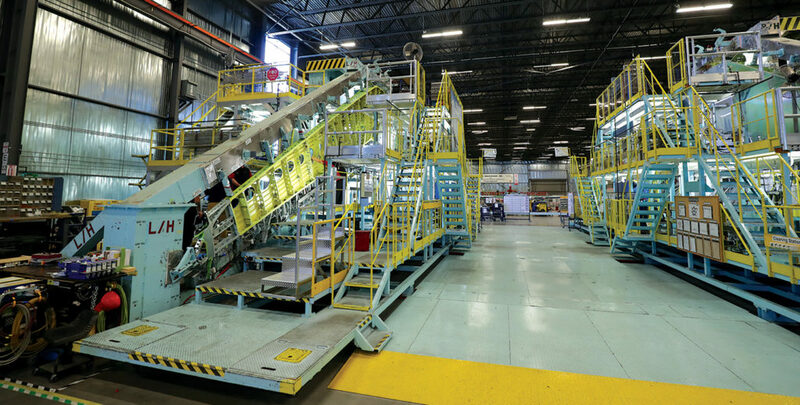 One of the advantages of MHI Canada’s investment in automation and flexible work cells is that it could build wings (or fuselages)for a single-aisle commercial jet, business jet and regional aircraft on the same production line to reduce labour and overhead costs. Another Canadian opportunity for MHI is the production of the country’s future fighter jet. 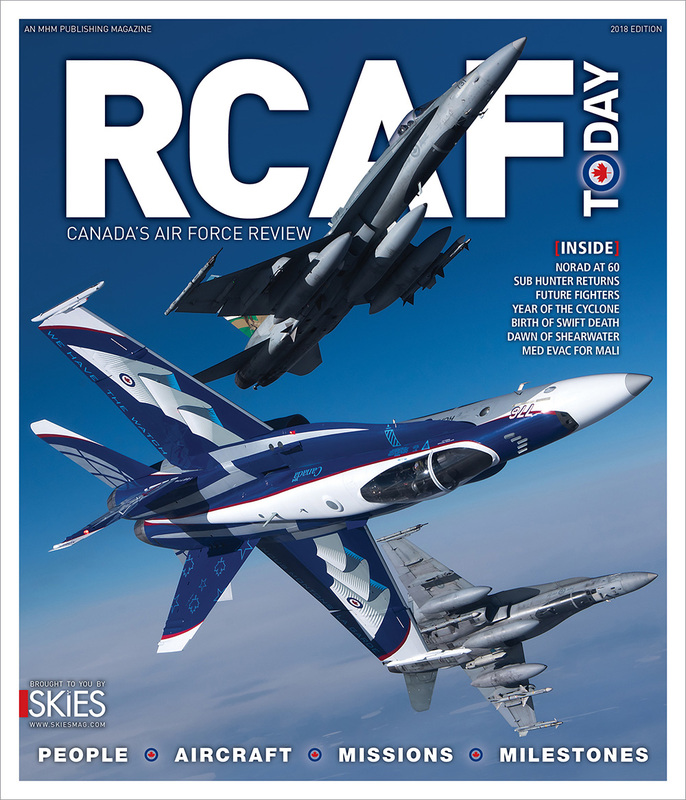 When Canada ordered the CF-188 Hornet more than 30 years ago, companies like Canadair and McDonnell Douglas of Canada got contracts to build parts, while other companies won commercial work that was part of an offset agreement. A year ago, MHI rolled out the first Lockheed Martin F-35 Lightning II it assembled for the Japan Air Self-Defense Force. Japan and other countries have created successful in-country fighter assembly programs, and MHI Canada believes this country is more than capable of doing the same.